We believe that leadership is not just about size; it is also about behaviour. Trust, too, is about behaviour; and we recognise that trust is earned only over a long period of time by consistently delivering on our promises. These objectives and behaviours are encapsulated in the simple phrase, “Good Food, Good Life”, a phrase that sums up our corporate ambition. 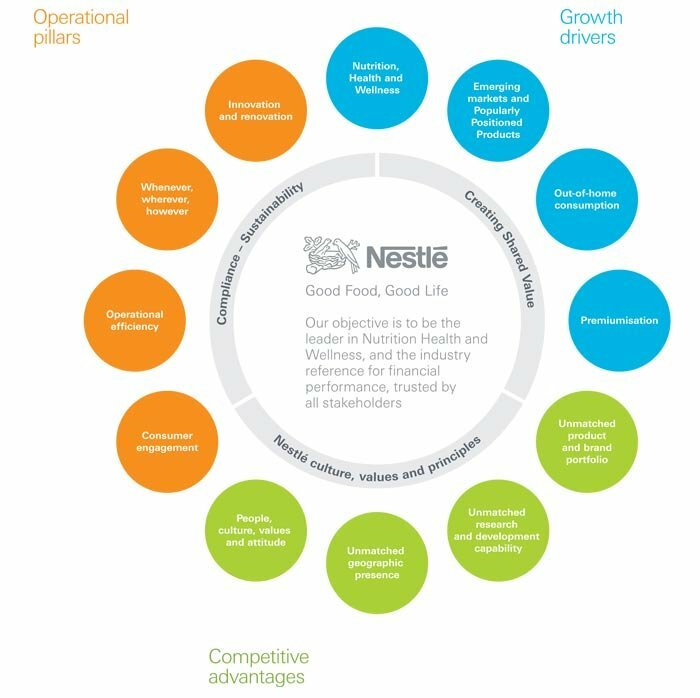 The Nestlé Roadmap (pdf, 58 Kb) is intended to create alignment for our people behind a cohesive set of strategic priorities that will accelerate the achievement of our objectives. These objectives demand from our people a blend of long-term inspiration needed to build for the future and short-term entrepreneurial actions, delivering the necessary level of performance. True competitive advantage comes from a combination of hard-to-copy advantages throughout the value chain, built up over decades. We are seeking to achieve leadership and earn that trust by satisfying the expectations of consumers, whose daily choices drive our performance, of shareholders, of the communities in which we operate and of society as a whole. We believe that it is only possible to create long- term sustainable value for our shareholders if our behaviour, strategies and operations are also creating value for the communities where we operate, for our business partners and, of course, for our consumers. We call this “Creating Shared Value”. We are investing for the future to ensure the financial and environmental sustainability of our actions and operations: in capacity, in technologies, in capabilities, in people, in brands, in R&D. Our aim is to meet today’s needs without compromising the ability of future generations to meet their needs, and to do so in a way which will ensure profitable growth year after year and a high level of returns for our shareholders and society at large over the long-term.